Indian Sprout Salad in Chutney Dressing-baffled beyond your mind? Let me explain. There are times when I want to eat healthy but something familiar, something Indian.This is for those times.It’s quick, utilises ingredients easily available in the fridge and has nutrients GALORE! Sprouts are insanely high on nutrients which means you should eat a lot of them! Really! 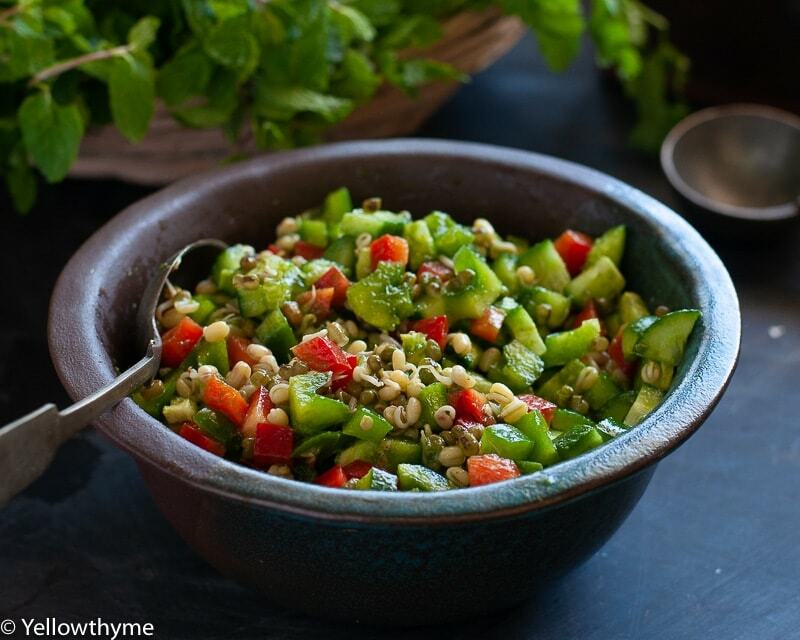 Sprouting dals activates their nutrients making them more bio available for absorption. Also they are super filling, which makes limiting carbs easy with them. Making sprouts is easy, especially if you have the sprout maker. Step 1: Soak your whole Dal(Moong) in water for 8-10 hours or overnight. Step 2: Drain the water, wrap them in a damp cloth and put them in a bowl.Cover lightly and let it sit for 12 hours.You should see sprouts emerging today. Step 3: Remove and wash the cloth.Wash the sprouts, wrap in newly washed cloth and sprinkle some water on them.Cover lightly and let it sit for 12 hours. Eating Sprouts Raw or Cooked? I usually make sprouts and home, so I am fairly confident about them but if you have bought sprouts from outside, I would recommend you always cook them before consuming. The reason is, that raw sprouts can be harmful, if they have been outside too long.Also raw sprouts are a little too raw for my taste.I like to par boil them before eating.That way the crunch stays but they aren’t too hard. Cook the Sprouts in 3 cups of boiling water for 10 minutes.Drain and let them cool. Meanwhile mix together the Green Chutney and Olive oil.Add a tsp of water if the dressing is too thick. Mix the Sprouts, Cucumbers and pepper toghether.Pour the Chutney dressing and eat! If you Love the Recipe, Please leave us a comment ! I would love to here from you! Looking for more Indian Salad Recipes?Fret not..Here are some amazing Indian salads.